Many a Chevrolet Camaro found its way to a drag strip: ever since the car was launched in the sixties up until today, this musclecar has been associated with straight-line speed and quarter-mile accelerations, a hobby perfected in America. 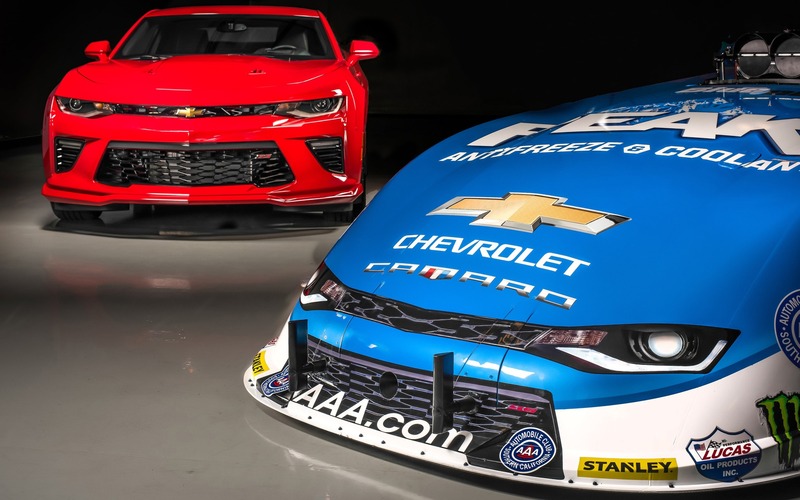 Chevrolet even offers race-ready Camaros from the factory: the legendary COPO Camaro has been a staple of the quarter-mile scene for decades in the Sportsman class. However, there is always someone who wants to go faster. And at some point, modified production cars just won’t cut it. You need to move to the Funny Car class, a division populated with tube-chassis dragsters wrapped in fiberglass bodies. The most recent is driven by John Force and has just been unveiled by Chevrolet. If you squint, the front end looks like a 2016 Camaro SS. However, that’s the only similarity between the production car and this dragster. The lightweight body features the latest aerodynamic advancements, is lighter than last year's car and is safer, too: if the engine were to explode—which happens frequently—blast panels will pop off to dissipate the energy before it can rip the bodywork away from the chassis. And just for fun, here is a quick rundown of this car’s performance: it goes from 0 to 531 km/h (!) and through a quarter mile in four seconds, powered by an alcohol-fueled V8 cranking out around 10 000 horsepower. That is one quick Camaro. Up to now, the most powerful version of the sixth-generation Chevrolet Camaro was the 2SS. While its 455 horsepower are more than enough to move the car's mass in traffic, it pales in comparison to its more well-endowed competitors like the Dodge Challenger SRT Hellcat and the Ford Shelby GT350.